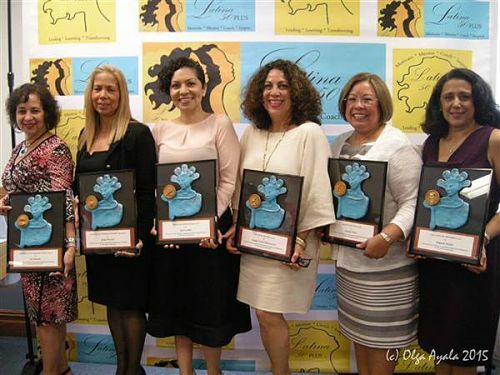 NEW YORK, NY -- Six Latinas over 50 whose important careers in the arts, community activism medicine and law paved the way for others were honored at a recent ceremony in New York City. The inaugural Latinas Fifty-Plus awards thanked these women for being trailblazers in their profession. "These career-minded professionals were the pioneers who fought to dispel commonly held stereotypes of Latinas, some of which are still with us today," said Maria Aponte-Gonzalez, an artist, educator and activist who wrote "Transitions of a Nuyorican Cinderella" and who founded Latinas Fifty-Plus. Chicago-born Castillo is a poet, novelist, short story writer, editor, translator, and independent scholar. She has contributed to periodicals, online venues, and national magazines such as "More" and the "Sunday New York Times" magazine. Castillo, who is Mexican-American, is also editor of "La Tolteca," an arts and literary magazine. Her award-winning novel, "Watercolor Women, Opaque Men," will be re-released Fall 2016. Mejia is the Assistant Dean, Admissions & Enrollment Services at the New York University College of Dentistry. She is in charge of recruiting and enrolling more than 400 students. Prior to her position at the college of dentistry, Dr. Mejia worked at the NYU Opportunities Program for 22 years advocating, mentoring, and developing programs to increase the number of underrepresented students in health and licensed professions. Ortiz- Morales is Coordinator of the HIV/HCV Specialty Service in the Infectious Diseases Clinic at Montefiore Medical Center in the Bronx, New York and an Adjunct Professor at Herbert H. Lehman College. As a nurse practitioner, Ms. Ortiz-Morales works as a primary care provider for HIV/AIDS patients and patients co-infected with HIV and HCV; she is involved in coordinating care and maintaining quality assurance. She has participated in numerous research protocols and several studies, and is a contributing author to a handbook about the management of side effects that occur during treatment for Hepatitis C.
In 1969, Morales became a leading member of the Young Lords, a group of young activists of Puerto Rican heritage who advocated for increased services and opportunities for Latino families. In 1976, Morales was the first Puerto Rican to enter NYU Law School as a Root Tilden Scholar. The New York native produced, wrote, and co-directed the award-winning documentary, "Palante, Siempre Palante! The Young Lords," in 1996. In 2012, she created Red Sugarcane Press, which publishes works that highlight the history of Puerto Rico, Latinas and Latinos, and African Diasporas in the Americas. Honorable Jeanette Ruiz is the newly appointed Deputy Administrative Judge of New York City Family Court. Judge Ruiz has over 20 years of experience in the area of child welfare. She is a former social worker, litigator and city official. The Brooklyn, New York native was a vocal advocate for the diverse populations in New York City and spearheaded the first Hispanic Heritage and Black History Month events in Kings County Family Court. Garcia-Betancourt is the Executive Director and CEO of the Northern Manhattan Arts Alliance (NoMAA), which cultivates support and promotes the works or artists and arts organizations in northern Manhattan, home of El Barrio. The poet, writer and activist's work has appeared in several publications such as "Breaking Ground: Anthology of Puerto Rican Women Writers in New York 1980-2012."